How have I not mentioned some very exciting information?! I'm in Arsenic and Old Lace! We open Friday! Any Cary Grant fans out there? You gotta love him from the old black and white film version. I'm playing Elaine Harper, the love interest of leading man, Mortimer Brewster. Arsenic and Old Lace, written by Joseph Kesserling in 1939, is a satirical, dark comedic romp about the Brewster family and the antics of one night. Aunts Abby and Martha care for their nephew Teddy who believes he is President Teddy Roosevelt. At the same time their other nephews Mortimer and Jonathon try to hide a murderous family secret. What follows is a three-act play depicting one 12 hour period at the Brewster home. Arsenic and Old Lace has been a fan favorite for over 70 years and this production will remind you of why you fell in love with this story in the first place … or will make you fall in love for the first time. Come find out why the family that slays together stays together. Arsenic and Old Lace runs at 7:30pm on March 23, 24, 26, 28, 29, 30, 31 with a 2:00pm matinee on the 31st. 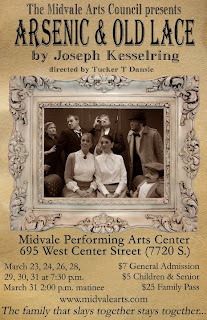 The show is at Midvale Performing Arts Center at 695 West Center Street (7720 South) in Midvale. 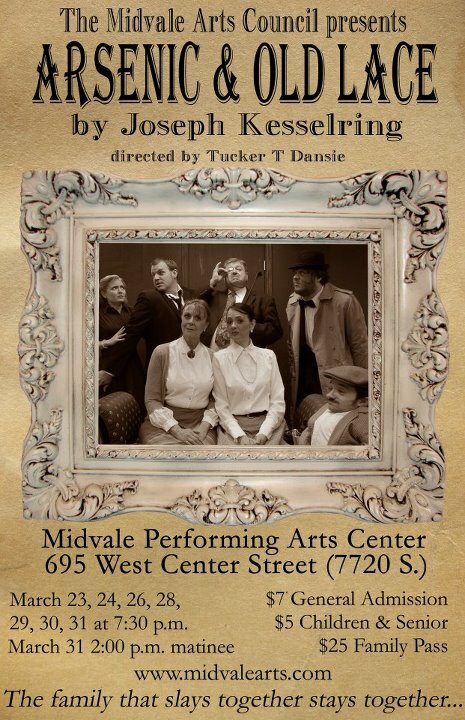 You can buy tickets at the door for $7 or group rates are available by emailing stephanie@midvalearts.com. Yes, you may recognize one of the stars of the movie "17 Miracles" in our cast. I can't WAIT to see it! I'm planning on going next Thursday!